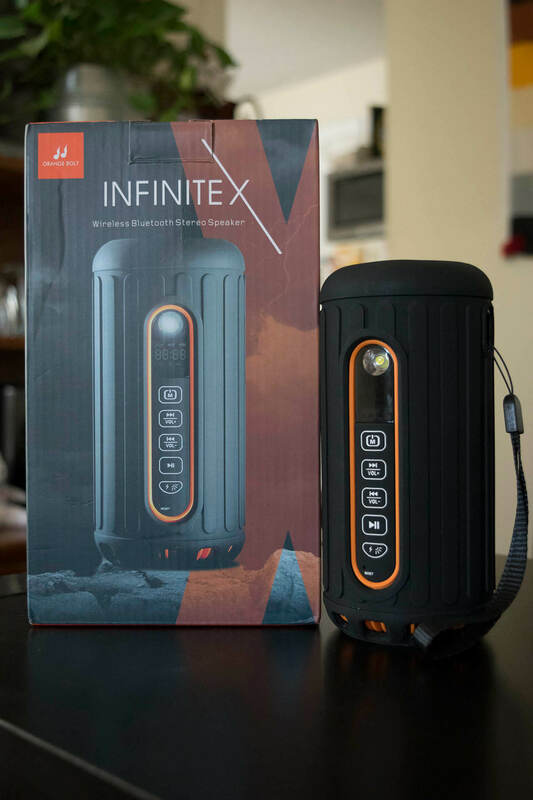 I got my hands on an Infinite X by Bliiq and on my quest for finding out the best bang for your buck, I managed to score what I think is the best Bluetooth speaker of 2016. This speaker happens to be waterproof, dustproof and it’s rubberized to withstand the test of time. The LED light on the front panel will definitely help anyone that’s looking at using this at night while being at the beach, cottage with friends enjoying some good tunes. To top it all off, you can use the microSD card slot that enabled you to have a device that’s ready to go. This is what I’d call a small speaker due to its size, weight and overall portability. Coming at around 1.4 pounds this makes it easy to just up and go. As noted above, the rubberized jacket the covers the speakers will ensure that it protects it from water and shock or almost anything else that may be thrown at you. Something to note, although this is a rubberized jacket, you may want to consider cleaning it off from time to time as some dirt, sand, dust can get in between the device and the rubber jacket. 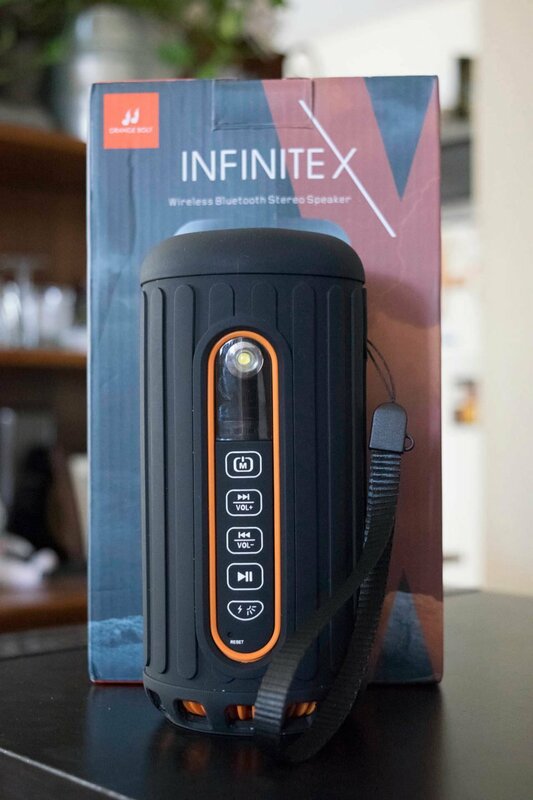 You may also want to know that the speaker is IPX rated 4 which means it’s only splash proof and not entirely “waterproof” as suggested on the Amazon page. You are greeted on the front of it with 4 buttons; Power, Volume Up & Down and Play/Pause. To use the buttons, you’ll have to hold them down for the desired effect. The lightning bolt icon offers you the ability to see how much power is left and by holding it down you turn the LED light on. While we’re on the subject of the LED light, I think you’ll be quite surprised at the amount of light you’ll be able to get. It wasn’t enough to illuminate my way in pitch black darkness, but it did the job. If you have power on your smartphone, you’ll find that it will work much better to use that instead. Flipping the Infinite X, you’ll find yourself with a flap that gives you access to a USB charging port that will allow you to charge your smartphone as well as provide you with the microSD card slow, an AUX output as well as the port needed to charge the speaker. When it comes to the life of the device on a full charge, it is claimed that you can get up to 30 hours worth of playback time. I decided to put that to the test and play music at full volume and I could about 11 hours worth of music time. So the claim of this lasting up to 30 hours might be slightly overshot. When it comes to the range of the Bluetooth device, often enough will run into a scenario where will have the smartphone paired to the speaker and will be going back and forth to the cottage and you’d start to hear the speaker cutout because of the range or signal degradation right? With the Infinite X, I didn’t run into any of that, I was impressed when it came to the signal quality I got. The Infinite X does sound like most comparable small Bluetooth speaker and is able to do quite well. However, if you intend to use this for more than entertaining friends you may find yourself disappointed. This is definitely meant for the small gathering outside enjoying the campfire or while lounging beside the lake or pool. The device is equipped with 2 well-rounded speakers that allow for a full 360-degree listening experience. The top speakers allow you to hear the music clearly as the bottom speaker acts more as a subwoofer. The bass isn’t as pronounced as I’d like it to be and even at high volume, you’ll be happy to know that there’s no distortion. The mids are decent and clear, but at a higher volume, you were able to hear the frequencies while the vocals felt recess a bit. When it came time to play EDM, you could note the difference between the “synthesised” pieces and thus creating a bit of distortion if you paid attention to it. With all that, I give it a 4 out of 5. The features are good, I like the options that were provided to me as a consumer and best of all the distortion was almost non-existent when playing a full volume. You can find the Infinite X on Amazon for $55.99 USD which roughly puts you at about $70 CAD. They’re different prices, but at the time of this review, this was the lowest price found. Bliiq also takes pride in their products and offers 1-year manufacturers warranty and an extra year for registered users, this allows you to get up to 2 years warranty. In the near future, you’ll also be able to find the Infinite X in various colours. I’d like to hear back from users of Infinite X, so why not comment, share and interact with me? Looking for other things I do? You can find me @ www.androidcoliseum.com. Previous HOGANAS Office Chair is slick looking, feels good and I love it! Next Add Bluetooth capability to your desktop or laptop with ORICO!